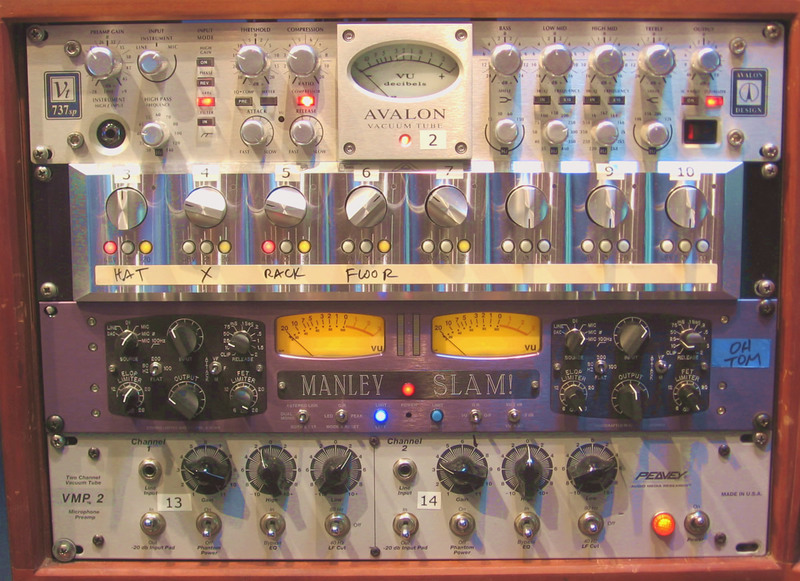 Avalon 737SP preamp: Class A tube channel strip with optical compressor and four band EQ. Grace Design 801: Eight channels of pristine transparent microphone amplification. Manley SLAM! : Two channels transformer balanced tube preamplification with both optical and FET compression per channel. Stunning. AMR/Peavey VMP-2 preamp: Surprisingly nice all tube mic pre, with basic EQ and Direct In on the front. Milennia HV-3 preamp: A long time standard for solid state transparent gain. It sounds like the microphone. blank: Hoping to put an API 3124+in here. Anyone have one for a good price? Neve 1272 pair racked by Brent Averill: Original Neve modules (not the current reproductions). It's a Neve. 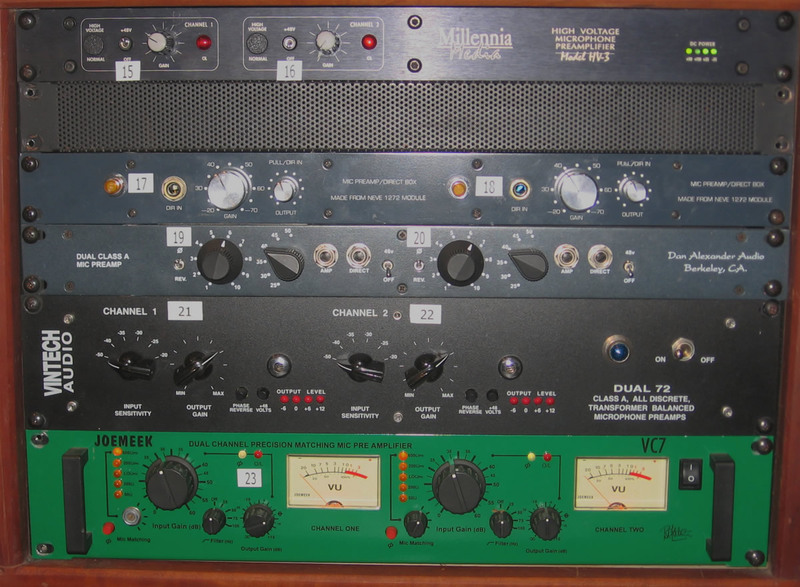 Dan Alexander Dual Class A Mic Preamp: Modeled after a Neve 1073 without EQ. Alexander claims that it "sounds identical". Vintech Dual 72: Their version of a Neve 1272. JoeMeek VC7 preamp: Transformer balanced stereo pre. This one doesn't seem to get much use. It's green. Universal Audio 1176: Recent production of the classic compressor. Linkable stereo version. DBX 160X compressor: An old standby, still works well on kick, bass and other instruments. Peavey/AMR VCL-2: Like their mic pre, better than you might expect. Nice to add some tubey overdrive when compressing. Dual mono. Tube-Tech CL 1A: Another true classic, it just sound "right". Just like the CL 1B except it's handwired and tubes are external on back. Waves L2 hardware compressor/limiter. 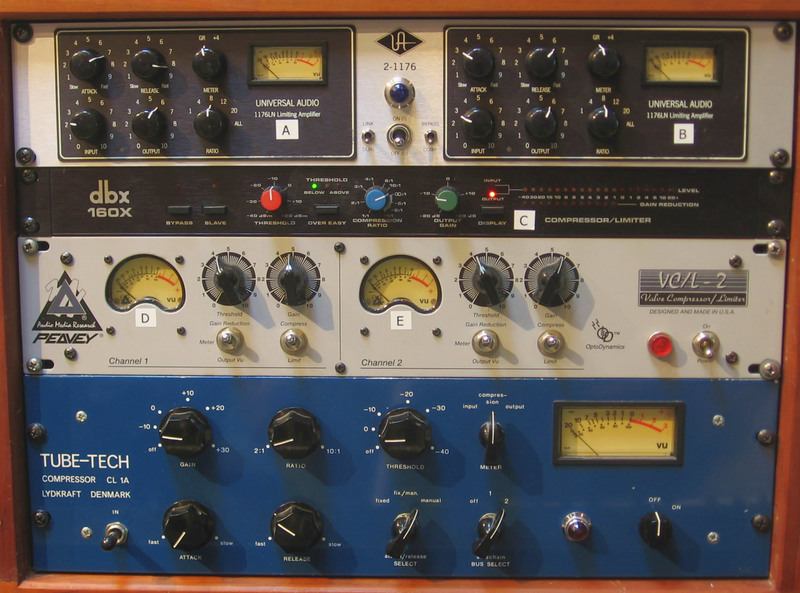 Still found in most mastering houses, and a nice converter. Meyer CP-10 stereo parametric four band EQ. Ins and outs to patch bay. It's moving once the Neve console is installed. A critical item: a guitar tuner. 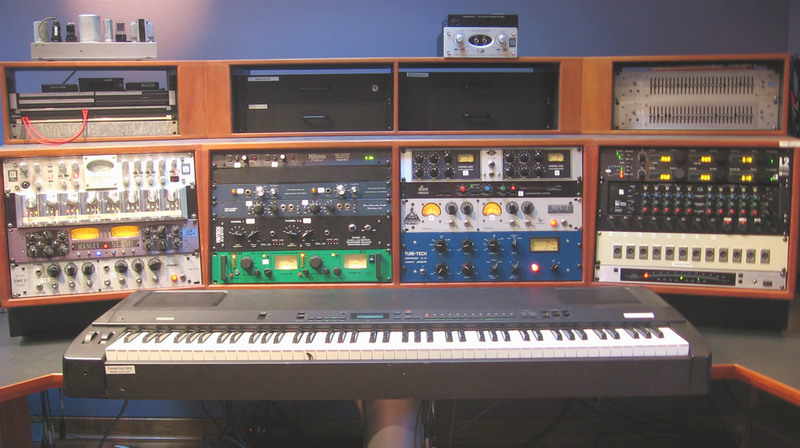 Those are some UREI graphic EQs (they've never been used), and an Avalon U5 direct box (it gets used pretty often). The black rectangles are drawers with manuals, mic clips, lots of audio adapters, and one for leftovers.